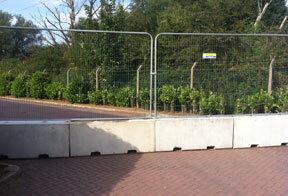 Polysafe concrete barriers could add an extra level to your site security – trespassers would need to move a heavy concrete obstruction as well as carry out whatever criminal act they were planning. This may make them simply not bother, especially if they have to get through locked compound gates as well!. Your site may be prone to vandalism rather than theft, and our concrete barriers which can accommodate Heras fencing may be the ideal solution for you – concrete barriers with 6 foot high heras panels on top are a challenging barrier to overcome.